Swedish filmmaker Stig Björkman’s new documentary - "Ingrid Bergman - In Her Own Words" (Jag är Ingrid, Sweden 2015) opens in San Francisco at the Landmark Theatres on Feb 12. The film highlights the work of a woman that dedicated her life to film. Stig Björkman co-wrote the documentary with Dominika Daubenbüchel, which is produced by Stina Gardell. Swedish vocalist Eva Dahlgren, who also sings the final ballad of the film, coordinated the Super 8 footage. Ingrid's letters to her friends and to her diary are read by actress Alicia Vikander. There are interviews with all of Bergman's children, and actresses Liv Ullmann, Isabella Rossellini and Sigourney Weaver. Ingrid Bergman - In Her Own Words debuted at the Cannes Film Festival in May and won special mention for a new award- The Golden Eye (L’Oeil d’Or award). The film came about through Björkman's friendship to Ingrid's daughter Isabella Rossellini who suggested that he make a film about her mother. Most of the film is found footage from newsreels but also footage of the home movies that Ingrid and her family made during her years in Hollywood, Italy, Sweden and London. There are memorable, well-constructed shots of her children and their many holidays together. The editing of this footage is brilliant. 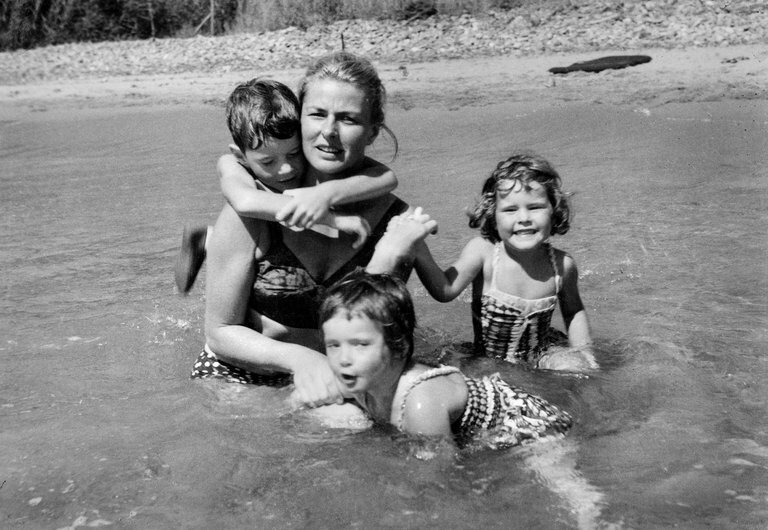 Above all it shows that the ultra professional Ingrid Bergman gave the greatest emphasis to her children who were apart from her during her busy acting schedule. Ingrid Bergman left Hollywood in the 1950's and married filmmaker Roberto Rossellini. She wrote to him and asked if he needed an actress who spoke English and a little French. That letter of invitation resulted in several years of marriage and the birth of three children, all of which are part of Björkman's film. Also present is Pia Lindström, Bergman's daughter by her first marriage to Petter Lindström. Ingrid defied the conventions of Hollywood and never regretted the things that she did, she said, but "what she hadn’t done". By her side throughout her career were several strong women including Irene Selznick, the wife of David O. Selznick, but her letters to them were always about her children. This extraordinary documentary makes you not only esteem Ingrid Bergman but also her children who have her incredible charm and intelligence. In many ways Ingrid never lost her Swedish roots and when working in the garden, raking leaves and pushing a wheelbarrow, the tall Ingrid Bergman remained down to earth. She worked with great directors, but although she could not control what was said about her abroad and in Sweden, in her own life she made her own images.